On the 12th of March, in a collaboration between British School Manila and TEDx - the programme inspired by TED conference designed for a local experience - inspiring speakers came to our school for musical performances and informative activities taught us a thing or two about expressing oneself. Everyone left the event a little more open-minded about how expressing you can change both you and the community around you. Each speaker had a different story to tell, reaching and inspiring every person in the audience. Roy Moore, the executive director at Fairplay for All Foundation, talked about his contribution to the Payatas dumpsite, and how his time there taught him that expressing yourself when building a community leads to enormous changes. A crowd favorite definitely had to be Sergio Gabriel, a spoken word poet and story teller. He taught us to never miss an opportunity to tell a good story, and that everyone is a storyteller in their own way. Every year, he grows his hair out then shaves it off to donate it to a cancer foundation. He does this because he's always looked up to his grandfather, who died due to cancer, giving him the initiative to help others who are suffering from this illness too. “The best stories that we can give are the ones that we are writing now.” As Sergio said, you should always be ready to answer the question, “What's your story?” Someone out there will be willing to listen. Jay Jaboneta, a Filipino blogger shared about the yellow boat project where he created a foundation that provides yellow boats for children to get to school instead of swimming. Ending his speech, Jaboneta told the crowd how self-expression, even in social media, can have large impacts. “We can do small things in a great way,” he concluded. Architect and interior designer Joseph Javier of Javier Design Studio Manila expressed himself through the design and aesthetics of Filipino Architecture. He enlightened the audience about how most of us today see our own country and how to embrace the ‘baduy’ (corny) and the ‘maarte’ (picky) traits of the Philippines. To begin the final segment of the day's event, Hindy Weber Tantoco shared her story of transitioning from a fashion designer to an urban farmer. Tantoco spoke about her daughter, who upon being diagnosed of a rare disease in which she can only eat a strict diet changed her life. Surprisingly, she realised that she loved what she was doing. "We can't stay stuck,"she said about her story, "Life wants us to evolve." Lastly, CarlitosSiguion-Reyna, who studied and taught at NYU at the Tisch School of the Arts, told us about how we can express ourselves through art - specifically, film. A total of 30 students, one teacher, 6 months of preparation, and over 100 emails sent out to participants made this 6-hour event possible. One week before the 12th of March, the whole team worked hard to meet active deadlines. 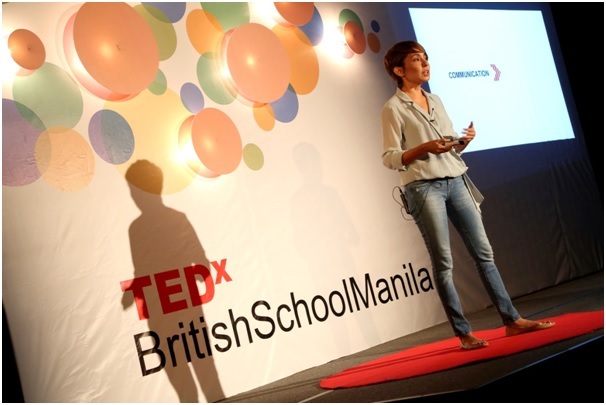 According to Jan Sy, former president of the TEDxBritishSchoolManila Team, “This year’s conference [was] very different from last year’s TEDx conference. It’s very different in a good way”. "There were a few stressful times," admitted Martin Tan, one of the vice presidents for this year's event, "but we pulled together as a team, and it was a really fun and rewarding experience, which will hopefully inspire and benefit those who got to watch." "TEDx this year was run by an amazing and dedicated team of Y12 students with a passion for ideas worth spreading," said Aurora Guild, the president and main organiser, "The speakers inspired the audience in all walks of life. We're incredibly blessed to have worked with such an amazing team, and thank you so much to everyone who made this possible! Our speakers, sponsors, and volunteers were absolute stars." "I'd also like to thank the patience of Winston, our student-led publication. TED and Winston share several members and the same meeting time, thank you guys for letting us have Gabbi, Julian, Michelle and Liezl for the last few weeks when it got critical!" added Aurora. "We can't wait for next year's event!" Staying true to the name and reputation of the TED conference, this event gave the audience an abundance of advice through eye-opening talks, and a reminder that expressing yourself can be done in a variety of ways which can change your life completely. Finally, TEDxBSM reminded us (or words to that effect) that we should not be afraid to take a leap of faith, embrace our individuality and show the world our truest self. This was written by writers of Winston, a student-led publication of British School Manila. For more, visit their website here. Get all your favorite spirits and wines on Duty Free Depot! All the world famous brand name beverages for unbeatable discounted prices.